Cellist Frances Borowsky has been praised by the Heidelberg Rhein-Neckar Zeitung as “marvelously colorful, performing with deep expression and a compelling temperament,” and has performed internationally as soloist and chamber musician in venues such as Carnegie Hall, Kennedy Center, and the Penderecki European Music Centre. She has soloed with the Tianjin Symphony Orchestra, Gettysburg Chamber Orchestra, Rheinland-Pfalz Youth Orchestra, Polish Youth Symphony, and Alexandria Symphony Orchestra. Ms. Borowsky’s major mentors have been Cecylia Barczyk, Amit Peled, Eric Kutz, and Alexander Huelshoff. She holds degrees from Towson University (BM), the Peabody Institute of John Hopkins University (MM), and Folkwang University of the Arts in Essen, Germany (MM). Ms. Borowsky is currently pursuing a Doctorate of Musical Arts at the University of Maryland, where she studies with Eric Kutz. 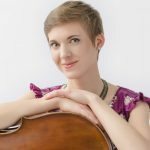 Ms. Borowsky serves as Assistant Director of the Intermuse International Music Institute and Festival, and teaches cello at Lebanon Valley College in Annville, Pennsylvania.